Design manager, Gabriella LaVerdi, features and entertainment editor, Lauren Minore, executive editor, Lauren Lavelle, managing editor Megan Lupo, sports editor, Rob Rose and sports writer Dylan Manfre at the NJPA luncheon. 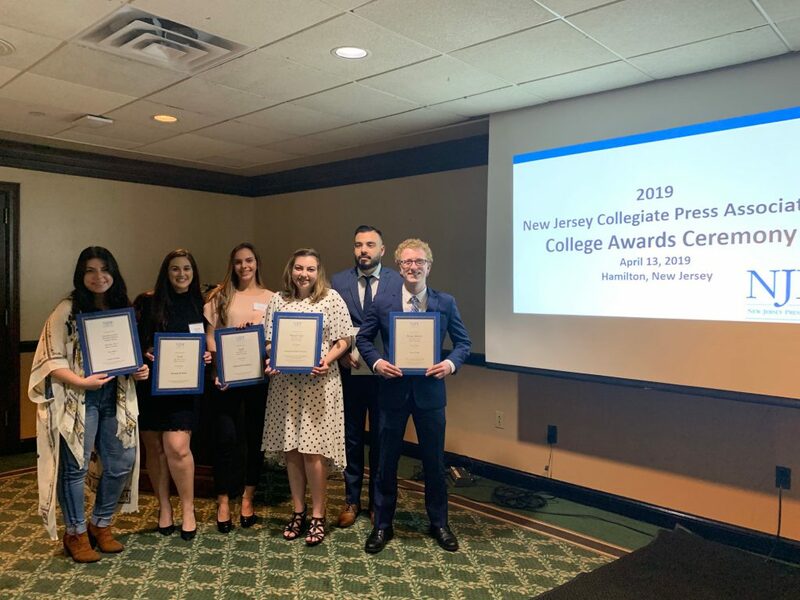 The Rider News won a number of awards at the annual New Jersey Collegiate Press Association Spring Conference and Awards Luncheon on April 13. Rider News also took home first place in 2016. The Rider News staff won first place for overall website and six staff members took home individual awards. Managing editor Megan Lupo won first place in the enterprise and investigative reporting category and design manager Gabriella LaVerdi and features and entertainment editors Lauren Minore and Nicoletta Feldman won first place for layout and design. Sports writer, Dylan Manfre, won first place for sports writing. Sports editor Rob Rose took home second place for web project, second place for online video and third place for sports writing. Opinion editor Qur’an Hansford is a finalist for the Society of Professional Journalists’ (SPJ) Region 1 mark of excellence awards for editorial writing. Institutions from nine states compete in the SPJ’s Region 1 awards. Many categories include finalists from universities such as Harvard and Yale. Minore expressed her gratitude for the opportunities that have been presented to her as a new staff member.